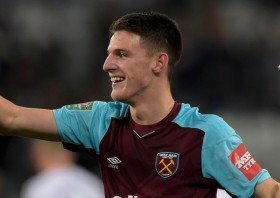 Manchester United will reportedly consider the departure of midfielder Nemanja Matic, should they secure the signing of Declan Rice from West Ham United this summer. The Red Devils have been keep a close eye on the midfielder's proceedings over the past year and The Independent suggests that he has been earmarked as the ideal choice to add some much-needed energy in the ranks. Rice is currently on a £30,000-a-week package, and United are said to be prepared to reward him with a 500 percent increase on his salary to lure him to Old Trafford ahead of next term. The move is likely to consider with the departure of Nemanja Matic, who has been average with his performances of late, while Ander Herrera could likewise head through the exit door. United will seek to garner a decent transfer sum from the sale of the Serbian in the summer, but they appear on course to lose Herrera on a free transfer with the Spaniard yet to sign a new contract beyond June.